Enter your information in the form below and we will notify Bennett & Roelofs Estate Service LLC that they can contact you about your inquiry. I always look forward to Bennett and Roelofs sales. Chris is friendly and approachable and knows many of his regular customers by name. He is a wealth of knowledge when it comes to all things old. His staff are always helpful. Prices are really reasonable. I also appreciate that he posts so many pictures of a sale to show what is there. Over the last six years I've made a number of transactions with Chris Bennett. Mostly furniture. I'm not a professional shopper, but I love estate sales. I mostly take requests from family and friends to look for specific items. He has always given me a more than fair price. One time I mentioned that I was buying the lawn mower for my elderly mother and he was very helpful and considerate. 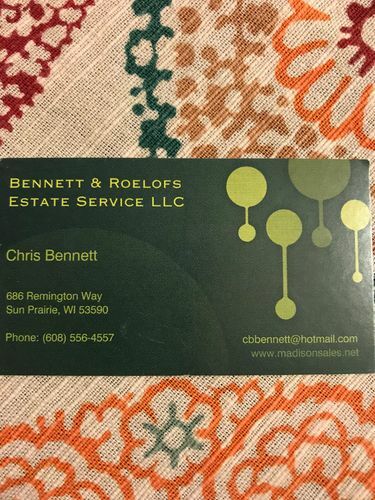 Thank you Chris, I will continue to look forward to Bennett and Roelofs estate sales. Fantastic Company ! Chris is AWESOME ! Chris is Very Professional and Serves his Clients with the Utmost Respect ,Loyalty and Honesty. Always keeps his Clients Needs and Values at the Front of the Business Venture. Treats his Staff in the same manner. GREAT JOB ! Helpful? Always look forward to Bennett & Roelofs estate sales. Very friendly and helpful staff. Fair prices and always a good experience! The staff are not only helpful but very personable. I am always pleased with the way it is setup making navigating quick and easy. Fabulous ! Very professional, from start to finish. We felt that they were really working for us. We were especially impressed when we overlooked a family heirloom, only to have it set aside, so it could remain in our family. Morals and ethics are rare attributes in today's world, but seemed to be the core of their service. We will recommend Bennett & Roelofs without hesitation. Thanks again, Chris, Taylor and your crew.